National 4-H Council is highlighting 4-H alumni and sharing the impact 4-H has had on their lives; this month, they spotlight a very special 4-H alumna, Martha Ann Miller, who celebrated her 105th birthday on August 6. On August 30, 1945, 4-H Club work got the spotlight during the broadcast of the college All-Stars vs. Green Bay Packers’ annual football classic known as the College All-Star game. It seems that 4-H is always up for a parade. 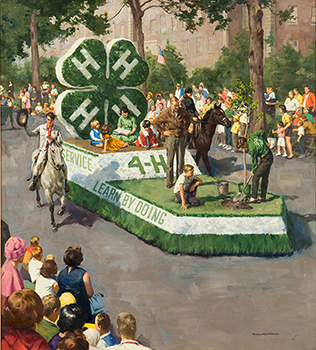 With Labor Day coming, how many 4-H History floats will we see in the country’s community parades? This 1968 National 4-H Calendar produced by Shaw Barton Calendar Company is an example of a 4-H float of yesteryear. What will we see on a 2016 4-H float? How did Drum’s Valley Pennsylvania, which documented its 4-H club history in 1959, get on the National 4-H History Map? Has your club, county or state nominated historical sites? 4-H’ers got state-of-the-art coaching as well as the chance to compete for awards in five categories. With the 2016 film festival over, it’s not too early to plan entries for July 2017. Let us know about the 4-H History exhibits you are presenting at County and State Fairs at info@4-HHistoryPreservation.com and send pictures.